Unique Wallscape – having bar cabinetry match that of the kitchen is common. However, it’s fun to have a back splash behind the bar that stands out, both for style and easy visual identification for guests. 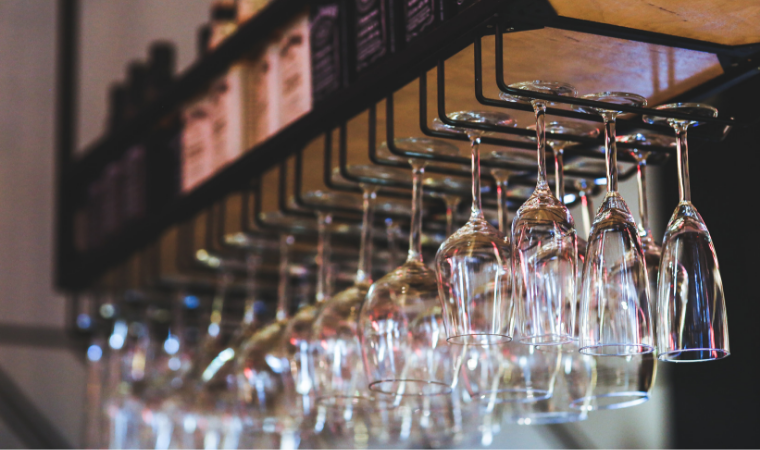 Location, location, location – just like a great piece of real estate, the location of the bar needs to make sense in your home and work with how you entertain. Often, we find clients prefer to place their bar in their living room versus the kitchen for easy guest access. Size – your bar doesn’t have to be significant in size, even a compact version will fit into a niche and look amazing with the attractive cabinetry and well-thought out design. Lighting – recessed lighting is great for over a countertop, while in-cabinet lights can feature unique and treasured glassware. Under-cabinet lighting is also recommended for setting the mood and crafting the perfect cocktail. We always like dimmable lighting with a bar, so that setting the mood can be done with the touch of a finger. Water – not necessary for every homeowner, but if you have the room and a water line nearby, a sink is a great addition to a home bar. Refrigeration – whether to keep your vodka ice cold, or that pinot at the perfect temperature, if you have the space to have some sort of refrigeration option within the bar design, we highly recommend it. Safety components are always a consideration if you’re worried about access for kids or teenagers. As always, we recommend tailoring the design to what makes sense for your family. Don’t put in a wine frig if you prefer a Manhattan. If you’d like to see more about our remodeling process, read more here.